While doing an interview a few months back with Turd Ferguson at www.tfmetals.com, he made the comment “gold has never been more valuable than it is today”. This is so true and correct, I’d like to break it down into small pieces because from a historical standpoint there is no comparison to where we are today. OK, I guess it would be best to first clear the air and address those who will say Turd’s statement is wrong because they paid $1,700 for their gold and are sitting on “losses”. Yes, from the standpoint of what gold will “fetch”, gold is “down”. Were you to sell it today or barter for a piece of real estate, it will take more ounces today than it would have two or three years ago. I get it and am not a stu-nod. The key word in the statement is “valuable” with the root word being “value”. The other key word is “today”. I bounced writing this piece off my mentor and he said “very good quote but I’m not sure it is true”. He went on to the examples of France just prior to the Revolution and to Germany prior to and during WW II. This is very true if you were French in 1790 or a Jew living in Germany but …like the snotty kid in grade school who likes to correct his teacher, I pointed out the obvious. In these two examples, only were the French and German Jews affected. Today, everyone on the planet will be affected one way or another because the dollar’s global pervasiveness and reach. As for “value”, the key is to retain value. Gold is THE only money all throughout history to have done this. Gold is THE only money on the planet that cannot default and THE only money which cannot be debased (though this has been attempted 24/7 by central banks forever). Digging into this deeper, even with many countries trying to distance themselves, the U.S. dollar is still a more widespread and all engulfing reserve currency than any before it (with the exception of gold). The dollar is held as “reserves” in central banks and sovereign treasuries all over the world. A “change” in the dollar for better or worse will directly and indirectly affect more countries, more institutions and more people than any previous reserve currency. We live in a world where everyone is “in bed” so to speak with everyone else. We live in a world of instant information made available by computers to any and all locations on the planet so a hiccup anywhere in the world will circle the globe in less than 24 hours. My point is this, how long would it have taken a devaluation in Dutch or Spanish reserve currencies to be known and understood 300 or 400 years ago? The answer is YEARS rather than minutes or even seconds today. The point Mr. Ferguson was trying to make is the current scenario is fraught with more risk (and not just financial) than any time all throughout history. Dollar (reserve currency) risk? Yes of course, but the truth is, it’s about “risk” in everything. Never before has the entire world been as levered as it is today. Never have central banks been more levered than the grossest and most bloated financial institutions in the world. Never before have scores of sovereign treasuries been collectively insolvent as they are today. Never before have bond prices been so high, yields so low and financial ratios so poor. Collective PE ratios and “rent to price” of real estate have never been where they are today. Derivatives never existed and the “rules” were never changed to the extent they are today. Think about it, have banks ever before in history been allowed to suspend real accounting mark to market or not report losses due to “national security”? Please do not tell me this was common in communist regimes because they no longer even exist, they have already failed and were not the center of anything. The Soviet Union went down the path of falsely reporting economic numbers, bending reality and living under “laws” that applied to some but not others, where did it get them? If you understand this very basic premise, “risk of everything” has never been greater than it is today then you understand the phrase “gold is more valuable today than ever before”. Think of it this way, if you absolutely knew 100% that an unstoppable forest fire or flood was going to strike your house, how “valuable” would your fire or flood insurance be? Would you be upset if you paid your premium and it took longer than a year for the fire or flood to arrive? Would you ever cancel your insurance policy at the end of the year, (still knowing a disaster was coming) and scoff at it while saying “I’m not ever doing that again, I lost money”? Do you see? Mathematically, our fiat currency system will fail. Mathematically, the current system of “debt equals growth” will fail. This is not “Bill Holter’s opinion”, this is fact because it is math! In the above hypothetical flood or fire, they can never be known 100% in advance. This is not so with our monetary system. The way our monetary system is set up we CAN know with 100% certainty it will fail, we just don’t know “when”. It is the “when” part that has people so discouraged. I am here to tell you it does not matter “when” this happens, what matters is whether you have your monetary insurance policy in place …or not. 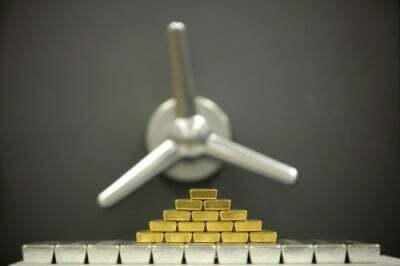 We know the central banks have every motive in the world to suppress the price of gold. We have seen several times where 50% of global gold production has been sold in less than two trading days, it is clear that actions have been taken to suppress the price. Can we do anything about it? Will “regulators” do anything about it? Of course not. However, if you understand this risk of financial collapse has never been higher than it is today then you then you know your insurance has never been more necessary or valuable. This risk will ultimately be borne out in the failure of what we use as money. If you are a student of history and understand what has acted as “financial insurance” time and time again throughout recorded history …then you understand what is meant by “GOLD HAS NEVER BEEN MORE VALUABLE THAN IT IS TODAY!” This is not rocket science, chart mumbo jumbo or opinion, this is 2+2=4 logic, defy it or try to time it at your own risk!